In January 2011, I switched from my old Pam Treo 755p to an Android touch screen smartphone. At first I was skeptical about not having a keyboard, but boy, that was the right decision. I’d had the HTC EVO 4G on Sprint for about two years and three months, and it was a really solid phone. Memory was getting a little tight, with apps like Amazon Kindle taking over 20 MB, but it was still good. I also had the best car dock ever, the Seidio Innotraveler: I just had to slip the phone into the dock, and it connected. No cords, just one hand. But the USB connector was starting to become unreliable, and since Sprint does not reduce the bill after the 24 month minimum contract length was over, I was essentially subsidizing Sprint now. It was time for a new phone. I also looked at cell phone coverage maps and download speeds, and Sprint really wasn’t doing so well. A co-worker recommended T-Mobile (yeah… I’m back under the descendent of the Deutsche Bundespost, the former German post and phone monopoly holder), and I like the fact that the payments go down after 24 months. That actually makes sense. So I switched from Sprint to T-Mobile and got a Samsung Galaxy S4. Well, actually, from Sprint to i-Wireless with my spare dumbphone to T-Mobile, because Sprint deactivated my line immediately, and it took a week to get the new phone from T-Mobile. I like the new phone. It has a bigger screen, which is something I didn’t actually want, but it’s thinner and lighter, so it actually feels like I’m carrying around less. And it’s a lot faster. T-Mobile also is a lot faster than Sprint. I like the fact that I can make free calls when I’m on a WiFi network. When I’m traveling internationally, I can call the US for free (provided I have wireless internet)! Google Now, which I didn’t know about before but which came pre-installed on the Galaxy S4, is pretty cool. It does a pretty good job of displaying what I actually want to know. And Google Currents has become my favorite way of reading… stuff. I don’t have all my feeds in there, those are in feedly now with the looming shutdown of Google Reader, but I have to admit, I probably have too many feeds anyway. I can’t keep up. Some of the gadgets of the Galaxy S4 are cool, but I don’t use them too much. I like Multi-window, but I’d like more multi-window enabled applications for simpler multitasking. 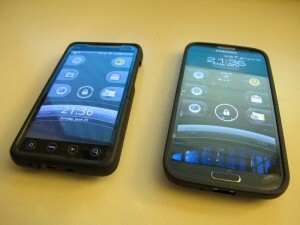 Smart Stay, the phone’s ability to stay on while I’m looking at it, or pausing a video when I look away, can be useful. But some of the other stuff, like waving my hand over the phone, I don’t really use. The camera on the Galaxy S4 has a lot of bells and whistles too, like an easy to use panorama mode, but I don’t use most of them. At least, I haven’t yet. Eraser, Drama, and Best Face all sound good, but I haven’t found applications for them yet. And over all, I think the Galaxy S4’s camera is worse than that of the EVO 4G, especially under low-light conditions. With the EVO 4G, I rarely had to use the flash, now photos often are too dark without it. And to make matters worse, I think the flash is worse too on the Galaxy S4. The Galaxy S4 itself is slim and light, but the phone feels plasticy and cheap. I always get a case, though, and I chose the same case that I had on my old phone, a Seidio Surface. 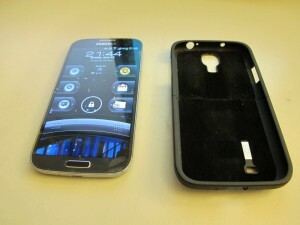 And guess what, this case is available with a kickstand, a convenient feature of my old phone. Now, with the Seidio Surface case, the Galaxy S4 feels solid again. I got an iBOLT xProDock active car dock for my car, and while it works, it’s not nearly as nice as the old Innotraveler. It takes two hands to get the phone in or out, because I have to lift a little clamp and plug in a little cord. Oh Seidio, won’t you make an Innotraveler for the Galaxy S4, please? Another neat thing about T-Mobile and the Galaxy S4 is that it uses a SIM card. That means when I travel, I can put another SIM card in, like the Vodafone SIM card that I’ve been using when I’m in Europe. Unfortunately I haven’t got to try this out yet because when I was traveling in May, I didn’t have a SIM card cutter yet, and my Vodafone SIM card was a full-size card, but the Galaxy S4 needs a mini-SD card. I’m paying a bit more, $94 a month instead of about $60 to $64. But I have to admit, the Sprint Employee Referral Offer plan was a fricking steal! Right now, I’m pretty happy with my decision. I just home this phone also lasts two years. 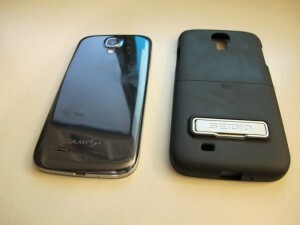 Old phone (left): HTC EVO 4G. New phone (right): Samsung Galaxy S4. New phone, Samsung Galaxy S4, feels cheap without case. The Seidio Surface case remedies that well.